At 23 to 29 Penns Lane there was a curious building, known as the Round House - it was demolished in 1970. The Round House was built in the 1840s, on land owned by Stanley’s Charity, when the surrounding area was still open country. In plan the building was in the form of a cross made up of five squares, each cottage occupying one of the outer squares and a quarter of the inner one. At the centre was a chimney stack with four flues for the fireplaces in the four cottages. The four cottages were identical, with one room downstairs and two up and a separate front door; outside there was a wash-house and privy used in common. The tenants of these cottages in 1851 were unskilled workers and their families - although the accommodation would be deemed substandard today, it was considered an improvement at the time, even for Matthew Grimley with his wife and seven children. He was a 40-year-old farm worker; his neighbour William Hiley, a gardener, also had a large family. George Britton was a carpenter with a wife and five children, and the fourth tenant, Joseph Adkins, was another farm worker with a wife and two young children. The names and occupations of the tenants of the Round House can be traced in the census records for the rest of the nineteenth century. It continued to be home to working-class families - one of the occupations given is “engine cleaner, locomotive”; the area was beginning to be built up, so there were fewer workers on the land. Most of the families moved on from their cottage after a few years, but there were Grimleys in one of them for over 100 years; Robert Bampton moved into another of the cottages in 1869, and some of his descendants still lived there in 1965. In the twentieth century the Round House, set well back from the road and surrounded by more modern housing, became something of a curiosity. For example, owing to the strange layout of the cottages, the chimney-sweep never knew which chimney-pot his brush would poke out from. When the property was eventually demolished, a passer-by warned the driver of the bulldozer to beware of the deep well - “I aint seen no well” was the reply, but an hour later the rear end of the vehicle could be seen sticking up out of the garden. 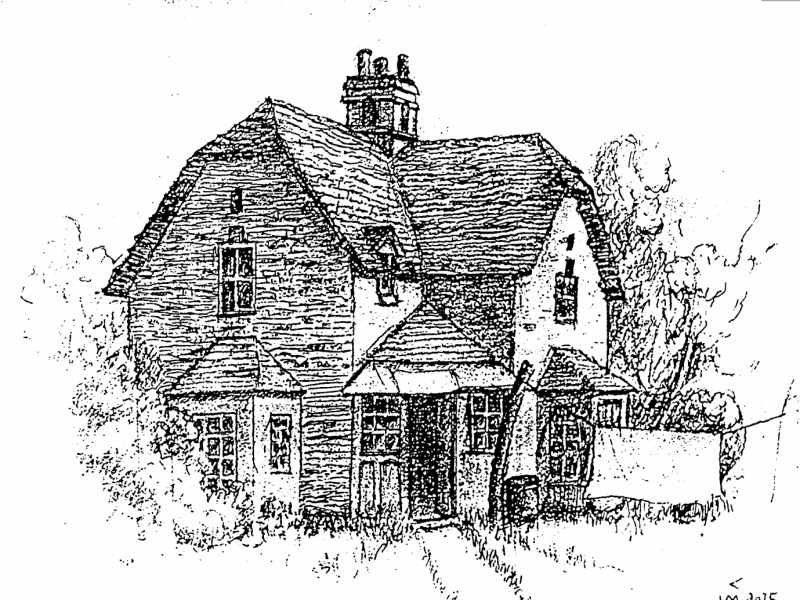 Sketch of the Round House by the late Jim May - the article is based on his research.